Everyone who has ever travelled knows how luck is important. On the road anything can happen. So if you know someone who is going on a trip, don’t forget to wish this person a safe and exciting trip. This section provides you with a variety of happy journey wishes to any taste. Travelling is so important. I know that you are real traveller. Wish you that this journey meet your expectations! Trips and adventures, holiday and sea, sun and sunbaths – it’s all you need for this moment. Wishing you a great time and we will celebrate it then you come back. See you! On this unusual trip I wish you to be crazy as never before. It’s your time to enjoy your life. Cheers! I appreciate your enthusiasm and bravery. This journey will be a real challenge. Get ready properly! I’m very glad for your trip. It’s a really good way to try something new and different. Love you much and will wait for your call with new stories! I would like to thank you for this opportunity to travel with you. I know that this journey will be unforgettable for both of us. See you on plane! It’s a wonderful time to celebrate your journey. I’m very happy for such good decision to travel. Don’t forget your glasses and hat! Do you realize that everything starts now? Wish you a good weather, sun and more time to relax. Wish you a good leisure. Do you book your flight yet? On this journey I wish you to find yourself. Also, it’s a perfect time to explore the world. I’m so happy for you. Are you ready for your trip? I wish you to see as much as possible. Good luck and happy journey! It’s not the first time then you go to the journey but I really worried about you. You know, new places, people and other things… But I wish you a good time! Bright sky, big waves and wonderful people – perfect holidays. 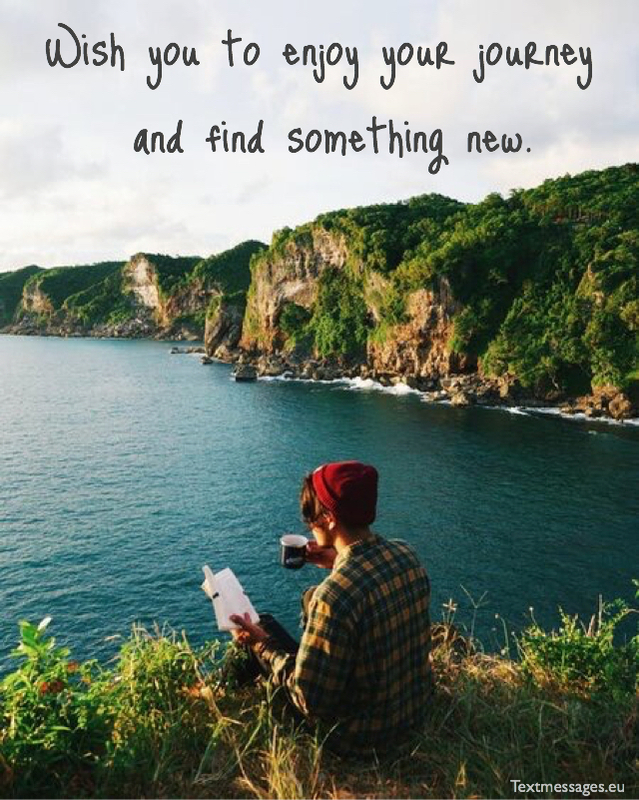 Wish you to enjoy your journey and find something new. Good flight! Today is a perfect day – the start of your trip. Wish you to enjoy the sunbaths and great tropical weather. I’m sincerely envy of you! Put on your sunglasses and dive into the holiday. Your trip is still waiting for you. Be ready for everything! Can you imagine that today is the first day of your vacation? Prepare for you trip and get ready. It will be so marvellous! Sun, sea, sand and coloured cocktails – the best part of the holidays. Wish you to have amazing trip with full of such things. Everything it’s just beginning. Finally it’s your time to take a rest. 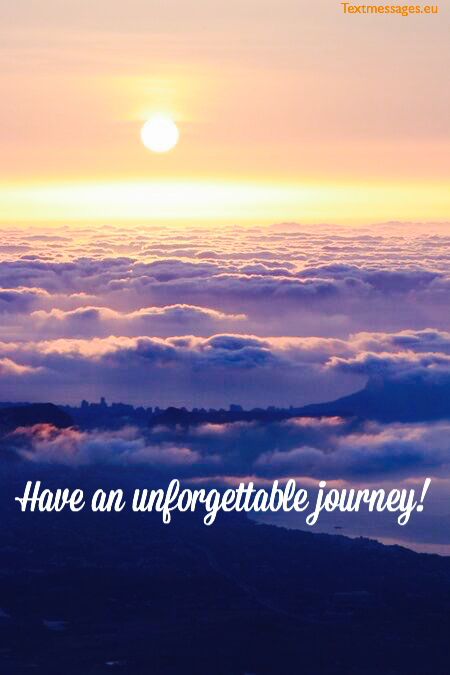 Wish you to have amazing journey and meet new people. Everything will be perfect! I want to wish you a good journey. It’s time for you to take a break from everything. Wish you a lot of fun! On this summer vacation I want to wish you to feel free and independent. It’s your time to think about nothing. Let’s feel the summer and good journey! It’s your time to celebrate your holidays. I wish you to have extraordinary time and unbelievable journey. I will wait you back. Sometimes we all get so tired that the only thing we want is to hit the road and forget about everything that bothers us. I’m really happy that you got such a great opportunity to travel and get some rest from this crazy world. Have a nice journey! Travellers are those people who search for something. It might be love, happiness, fun, new friends or an unforgettable experience. It doesn’t matter what you are looking for, I wish you to find it. May this trip bring you joy and happiness! Oh, I love when somebody is going on a trip! It means that I’ll get my souvenirs very soon. Well, get my orders. I want you to bring me many unforgettable memories, bright pictures and a good mood! Okay, and one magnet. Ha-ha, have a great trip! A trip is meant for relaxing and having fun, not getting drunk and wasted, remember that. Because after your last trip I don’t really want to let you go on your own, but you’re a grown up, so I hope you don’t set anything on fire. Happy journey! What can be better than an exciting trip to the place you’ve always wanted to visit? I’m so happy that your lifelong dream has finally come true! I truly wish this trip would only bring lots of bright impressions and unforgettable memories. It doesn’t matter whether you’re going to the countryside or somewhere far away, you should now one simple thing: we always are waiting for you to come back. Hope you’re having an amazing trip! And make lots of unforgettable memories. Every journey is a life lesson, because it teaches us how to be tolerant and kind to other people and how to be grateful for little pleasant things. Finally, it teaches us to be happy and take the most of our life. Enjoy your trip! We all hope you are having a happy one. We’ll see you when you get back! And even more new friends.